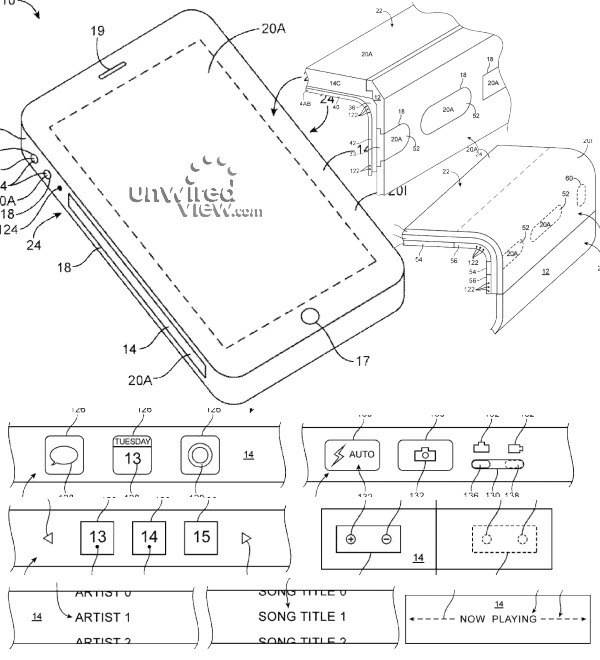 These are certainly not the first flexible display related patent applications that we’ve seen from Apple. A few different Apple patent applications have received attention in recent months, including one for a slap wrist-style bracelet with a flexible display, and others for curved and flexible displays in various iOS device-like form factors. Today we’ve come across a couple of recently published Apple patent applications filed as early as September of last year that further show Apple’s work with flexible displays (via UnwiredView). User interface components may be configured to initiate a response from the device to the detected twist such as turning the device on or off, entering active or standby mode, answering a cellular telephone call, starting a software application, changing a volume associated with audio or video playback of media, starting or stopping audio playback of media, etc. For example, twisting a flexible electronic device may change the operating mode of the device, may be interpreted by the device as a command to an electronic gaming system, may turn the device on or off, etc. Edge displays may be separated from front side displays or from other edge displays using patterned housing members, printed or painted masks, or by selectively activating and inactivating display pixels associated with the flexible display. Edge displays may alternately function as virtual buttons, virtual switches, or informational displays that are supplemental to front side displays. Virtual buttons may include transparent button members, lenses, haptic feedback components, audio feedback components, or other components for providing feedback to a user when virtual buttons are activated. During operation of an electronic device, a virtual button may be, for example, a virtual volume button for controlling audio output volume and may be repurposed based on user input to become a virtual camera shutter button for taking a picture or may be reconfigured to serve as a controller for another device function.